Well, my chalk frames seem to be a huge hit!!! Thank you everyone for the tremendous support! I had many of you ask me if I would put all of the frames in one mega bundle... and ... I listened!! I condensed the files as much as humanly possible without compromising resolution and I was able to BARELY make the cut!! Thanks so much, I am happy I got this deal. First the power was off all day and now a thunderstorm, so I will download these soon. Thanks so much! I know what you mean about shopping, spending money and coming home with what seems like nothing - that happens to me all the time! 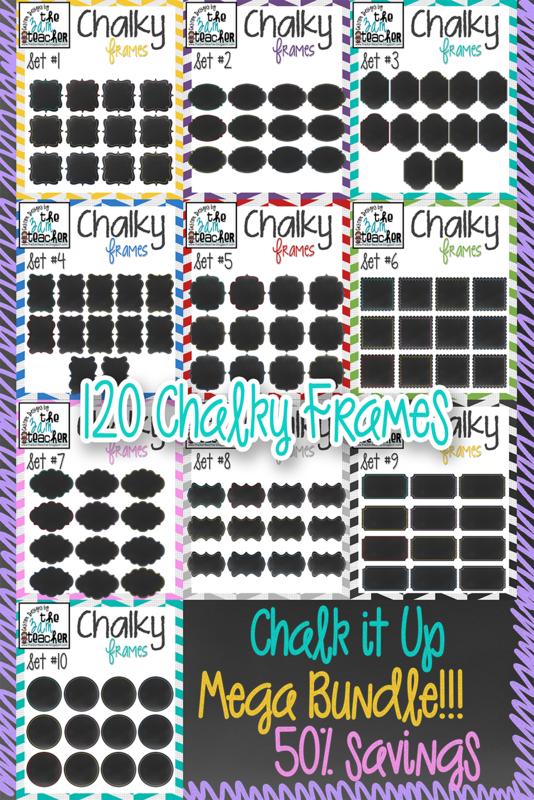 Love this Mega Bundle, I can't get enough of the chalkboard look! Love the chalk frames! I sent an inquiry about a custom blog design about a week ago. Just wanted to make sure you received it! I haven't heard anything back so I was just wondering. :) Thank you! Thank you so much!! I am loving the chalk look lately. I did not receive anything from you about a custom blog design... Did you complete the form or send me an email?? LOVE These chalky frames!! Such a cute look for classroom or anywhere! Thanks for sharing I will definitely be checking it out! !